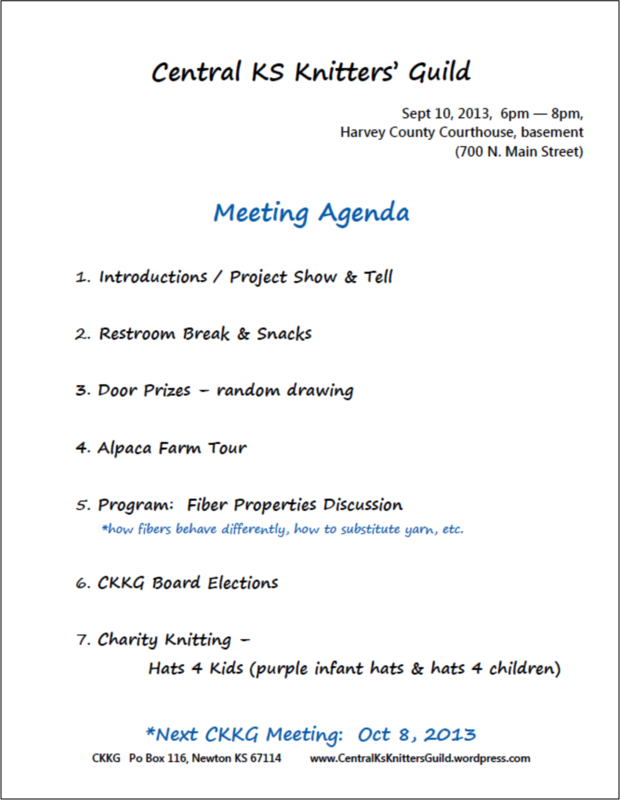 Grab your knitting and a friend and join us for the Sept Knitting Guild meeting! Tuesday, Sept 10th from 6-8pm at the Harvey County Courthouse (Newton, Main & 7th streets). *Check our Ravelry page for more information and carpool details. The seasons are starting to change (well, it’s getting close) and the Farmer’s Almanac is predicting heavy snow this winter. So, several of us have decided to knit hats for kids. We will start collecting hats of all sizes and colors (and specifically purple infant hats) to be given out to local organizations, hospitals and charities. *The Purple infant hats are due to be turned in Sept 27th. Find all the details and free patterns on our Ravelry page. We will have extra patterns at the meeting if you want to pick some up…they are great purse knitting since they fit anywhere and take no time at all. Next Next post: Sept Meeting Recap!